Motorcycle Alley is fast becoming the preferred online destination for all things that riders need to keep them on the road, dirt, mud, sand or track. The business website, which was created by riders late last year, has quickly grown in popularity and is taking off. It¿s a comprehensive, easy to use, ¿one-stop¿ shop for everything. Whether you¿re looking for new and used motorcycles, accessories, parts, gear or clothing, you will find it all here. You can check out bike club events, locate a wrecker or specialised service store or link up with a club that is full of like-minded enthusiasts. If you ride a motorcycle, be it two, three or four wheels, this is most definitely the site to bookmark. It¿s set to be the prime location to buy or sell all your motorcycle related bits and piece, NZ riders are heading there in droves. Visitors to the site have grown steadily, and we can see why. It is a slick looking site with the right mix of attitude and professionalism. You¿ll find it easy to navigate around to find what you¿re looking for, or maybe stumble across plenty of cool resources such as the ¿Great rides¿ section or the ¿Stolen motorcycles¿ register. There¿s plenty going on and to top things off they¿re offering premium listings absolutely free-for a limited time! 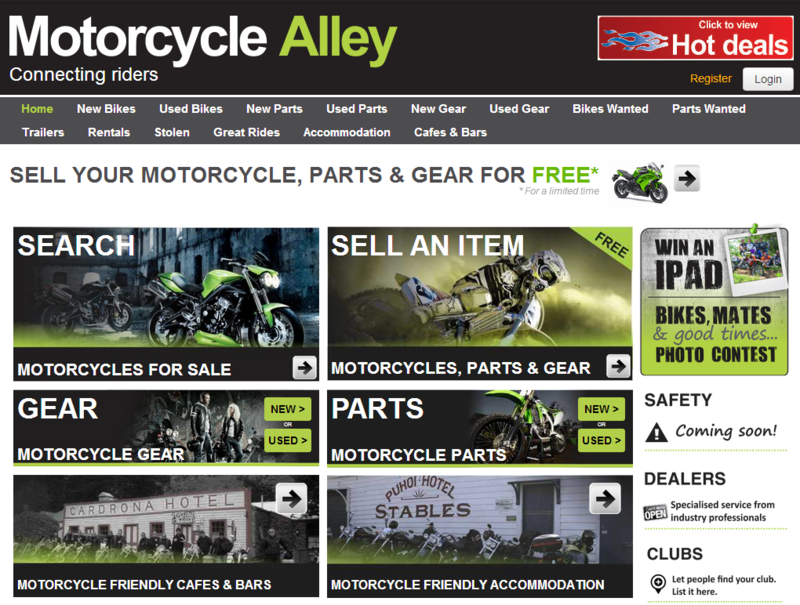 Go on, check it out www.motorcyclealley.co.nz ¿ we know you¿ll love it.